Click here and use code "MEDIATE" to receive a 10% Discount Code. What is the Challenging Workplace Behavior Summit? 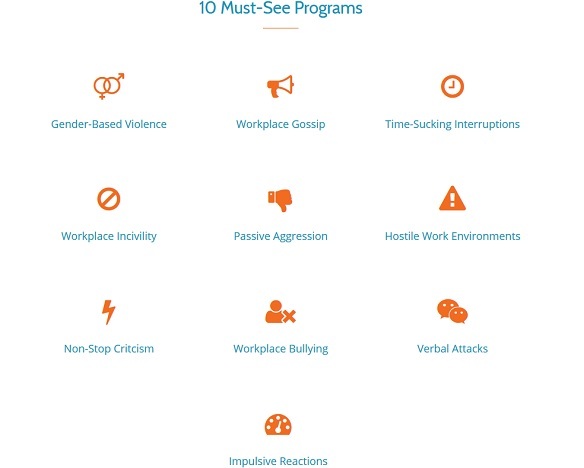 The Challenging Workplace Behavior Summit was developed by MH Mediate and Conflict Connections. We brought together 10 top global experts, resulting in a complete toolkit for the ten toughest behaviors at work. "This provided great insight as well as tools to equip me as a manager This was very helpful, especially with a specific stepwise process for addressing passive aggressive behavior at work." "I will be using the suggestion to offer "two minutes right now, or ten minutes in an hour" right away!" "Excellent discussion. Great infographic and very useful examples discussed during the presentation. Thanks." "This was excellent. Such a pervasive problem and the presenter provided great examples of strategies to address the issue." "This was a great topic...had lots of good info about the differences between "illegal" hostile environment vs. toxic and/or destructive work environment, "the gateway drug." "Simple and effective technique for managing verbal attacks. Nice three step approach. Explained well." "Great speaker, great topic. Essential tools provided to changing negative behaviors and providing positive feedback." "Very affirming to hear of the need to address incivility even if it is being experienced by a 'velcro' personality. Critical to for hr/admin to understand that behaviors will escalate if not address." "All three programs I tried today were really helpful. Thank you!" What are people saying about the Summit Resources as a whole? "Just wanted to let you know how much I enjoyed and learned from the summit programs. I thought the format was great, with a sensitive moderator bringing out the nuggets of wisdom provided by the insightful and informative speakers. I also appreciated how you broke the presentations into two parts, one delineating the 'issue' and one focused on strategies to address it. I will continue to listen and learn." "I’m just reading through the materials now…they are very helpful and I’m enjoying the format of the material. Well done! " "The resources are great...thanks so much!" "The videos are very informative, and have already introduced quite a number of ideas and insights I had not considered previously." How common are these behaviors? Click here to see an infographic with prevalence statistics for each behavior. Dan Berstein, developer of MH Mediate's Ready for Anything framework for addressing challenging behaviors, explains why we sometimes mistakenly act on gut feelings and how we can plan ahead instead.